Moose Nuggets are the droppings of moose during the nine months of winter in Alaska. In the summer a moose diet consists of fresh leaves and this produces "Loose Moose" droppings similar to a bear. The rest of the year, moose eat dry shoots and twigs, and the droppings become the familiar Moose Nuggets. During those nine months, the average moose produces 375 nuggets per day. The distinctive nuggets have can be made into jewelry and novelty items. 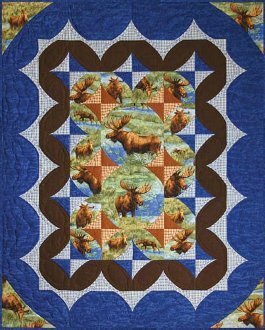 The curves of the Moose Nugget quilt are created by turning back the bias edges of a folded triangle or folded flying geese. The techniques are appropriate for an intermediate quilter and are fully illustrated in the pattern. 50" x 62"